Remember that Steam VR game Dean 'Rocket' Hall revealed he was working on at E3 2015? Well, it's about to hit Steam Early Access as a HTC Vive exclusive and boy, does it look a lot more cutesy than we were expecting. Don't let Out of Ammo's cartoon visuals fool you thought - it may look like a less pretty version of Firewatch, but that doesn't mean this game is all sunshine and rainbows. In fact, it's mainly machine guns and grenades as you traverse a battlefield in VR. 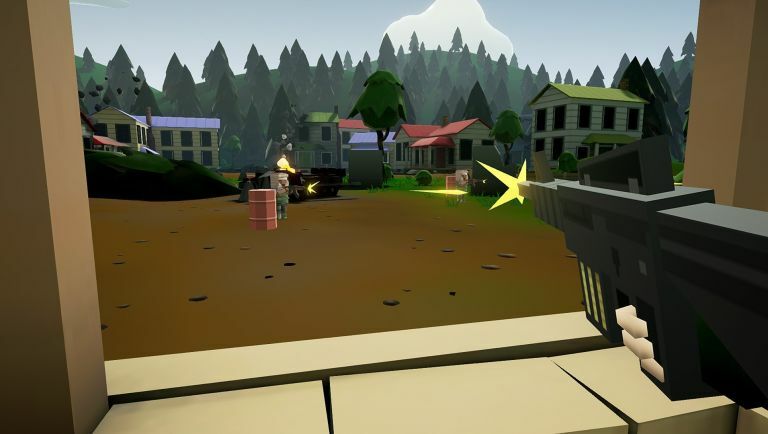 Developed by Hall's post-DayZ studio, Rocketwerkz, Out of Ammo is a strategy game that places you in the hotseat of an army commander, battling waves of increasingly tough enemies. Designed exclusively for HTC and Valve's VR headset, you'll use head tracking and the Vive's bespoke controllers to traverse the battlefield. You'll even have the power to build watchtowers, command units and even take control of them for a more direct approach to armchair warfare. The game will also come with different maps (Woodland, Urban, Desert and Alpine) and will offer five different units to choose from, including Sniper, Rifleman, Rocketeer, Medic and your standard plucky engineer. Out of Ammo is out now on Steam Early Access for a cool £10.99 (or $14.99 if you're in the United States).